Every self-respecting hipster needs a smattering of culture, so we spent some time in Rome staying near the piazza of Testaccio. Between lovely meals, walked off in the (relatively) cool shade of the Tiber banks, and a daily siesta during the hours of the sun’s anvil, we tried to catch a few galleries. Rome, probably owing to the many of young foreign artists on residencies at the British School, the American Academy, the Swiss Institute, etc., and the not-inconsiderable amount of, probably ill-gotten, money there, has a decent whack of good galleries, and has had so for many years. While Milan, Trentino, and the Veneto may have the lion’s share of wealthy patrons, foundations, and galleries, there are quite a few interesting spaces in Rome, Naples, and increasingly, Sicily. 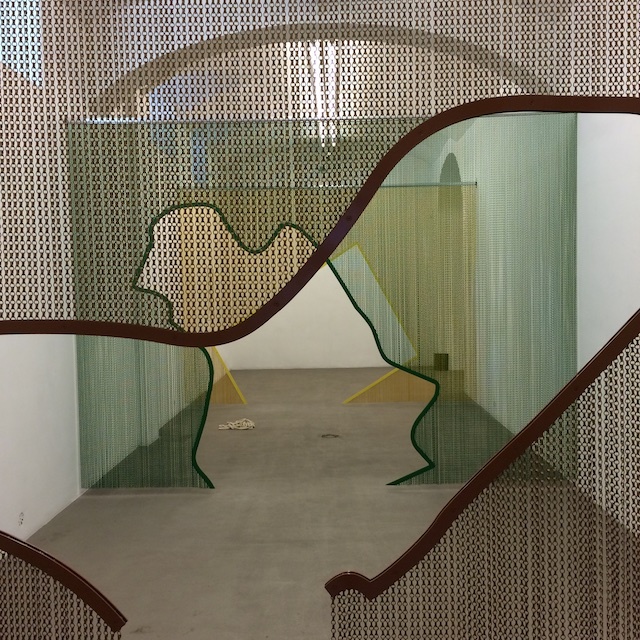 Anyway, to start with we dropped by Fondazione Giuliani: a lovely space improbably housed in the basement of a large, reasonably attractive early twentieth-century apartment block in Testaccio. It shows specially commissioned projects and collaborations, but also presents the collection of Giovanni and Valeria Giuliani. 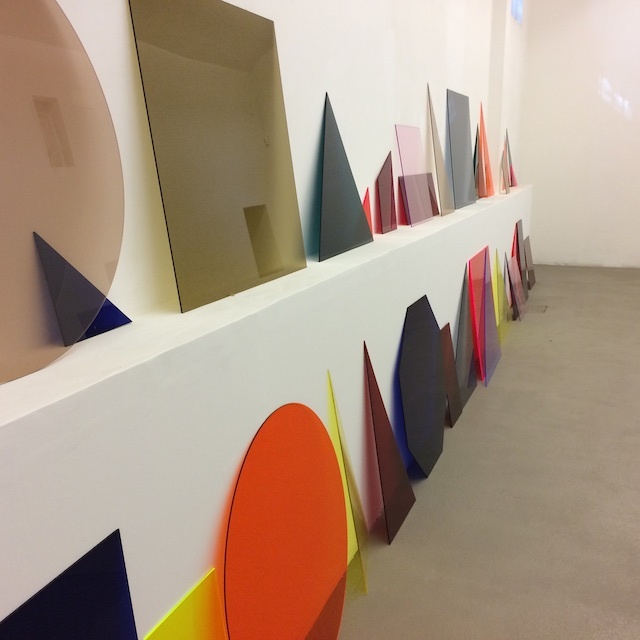 It was a group show of high-calibre international artists, amongst the standouts of which were Daniel Steegmann Mangrane’s theatrical screens made of coloured metal chain-links. Alexandre Singh’s evocative sculptures alluded to his play The Humans, a riff on Aristophanes. Haris Epaminonda’s floor and wall pieces were placed around the show, and Fischli/Weiss’ seminal film The Way Things Go was riveting. The exhibition was beautifully curated by Adrienne Drake and produced in conjunction with Kunsthallelissabon in Lisbon. The highlight of the trip was identifying a rather unremarkable deconsecrated church in which NY gallerist Gavin Brown has opened a non-traditional exhibition space, roughly at the same time as his much-better-publicised valedictory show in the West Village, with its re-staging of Jannis Kounellis’ Untitled (12 Horses). Located, un-numbered, on one of the smaller streets in Trastevere, we had to ask a few crones whether they remembered a church in the area, and as we got warmer, we enquired at the neighbourhood stalwart Trattoria Da Enzo. We guessed, correctly, that this would be the place where the gallerist used to lunch, back in 2005 when he first spotted the church, when he ran a gallery in Rome with 2 other gallerists, Franco Noero and Toby Webster. We finally found it, but unfortunately lost the photographs of the inside – but it is very far from the typical ‘white cube’. 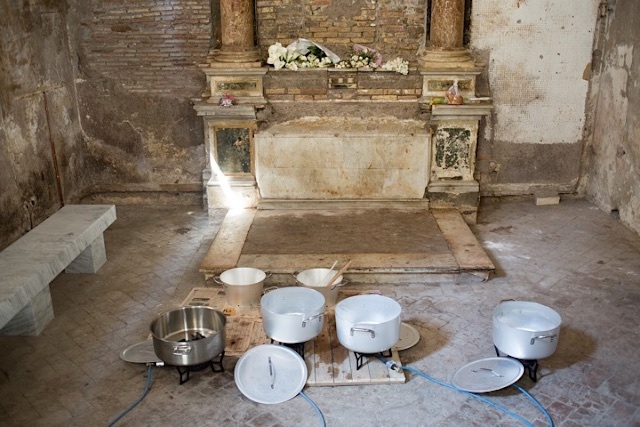 Essentially it is an austere church, stripped of any baroque decorations it had, and just in front of the altar were a number of pots on portable burners, with what looked like black (marble apparently) sheep skulls and bones in them. On one of the two marble slabs was a well-dressed lady, to all intents and purposes, passed out with a couple bottles of beer next to her. The space was open to visitors, but it wasn’t so comfortable: we seemed to have stepped into an performace and installation of Rirkrit Tiravanija, an Argentine-Thai artist and professor at Columbia. I had one more reason to find his space – I remembered a bar called Passerby that Brown founded. It had a disco-lit floor that I and a coterie of Sicilian artists, in the much more affordable Chelsea of the 1990s, used to colonise. 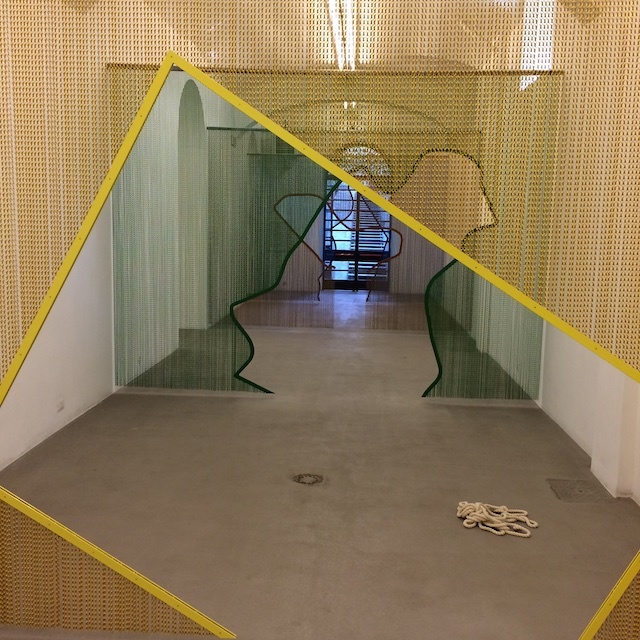 Galeria Indipendenza had a joint show of Charlotte Posenenske and Tauba Auerbach. 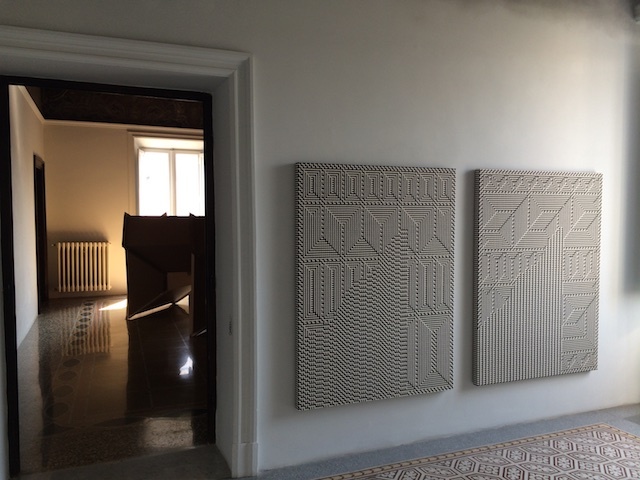 Auerbach had some rather lovely textured and woven paintings inspired by the architecture and decoration of Rome, which worked beautifully in the the gallery’s elegant rooms. 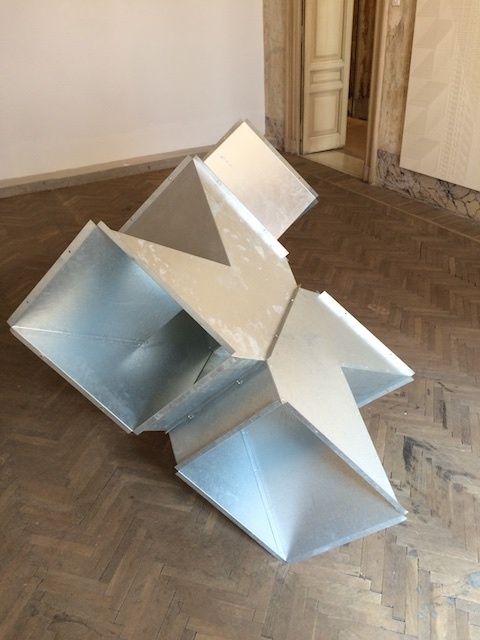 The late Posenenske was represented by gorgeous non-functional ducting: galvanised steel or cardboard sculptures, which were either originals or replicated by Auerbach (Posenenske in her life rejected notions of unique works in an apparently political statement). The sculptures remain highly contemporary, reminiscent as they are of restaurant ducting, high-volume air conditioning (HVAC) ducts, or the cooling equipment found in, say, a server farm. Again, this isn’t a guide-book – just places I particularly liked. 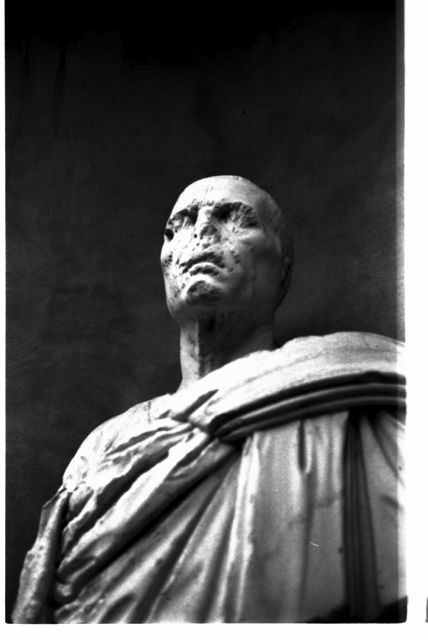 Trajan’s Market – this has been restored with a well-done iron-clad museum, that last time, had contemporary art in it. Quite cool museum space in an old building (incidentally, jazzing up ancient spaces for modern viewers is something the Italians seem to do very well), and an unusual view over the imperial fora. Palazzo Farnese – tours are available, by booking with the French Embassy (whose building it is). 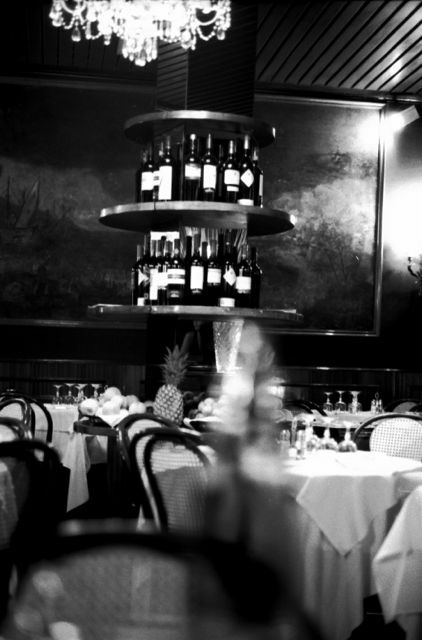 Afterwards, have a drink at Bar Camponeschi. San Luigi degli Francesi – inter alia the Caravaggios. Have a coffee before or after at Cafe San Eustachio nearby, or the one across the square that is less popular but perfectly good (especially if you don’t care for sugar in your espresso). Catacombs – definitely worth a visit, if only for the walk from the bus stop, through green fields and a lane of bougainvillea, not far from the Via Appia Antica. Particularly welcome in the stifling city heat. The catacombs themselves are impressive, if rather less spooky than Palermo’s crypts. Basilica San Clemente – must go, there are two basilicas (4th and 11th century) built on top of a mithraeum, with a super relief of a bull sacrifice. 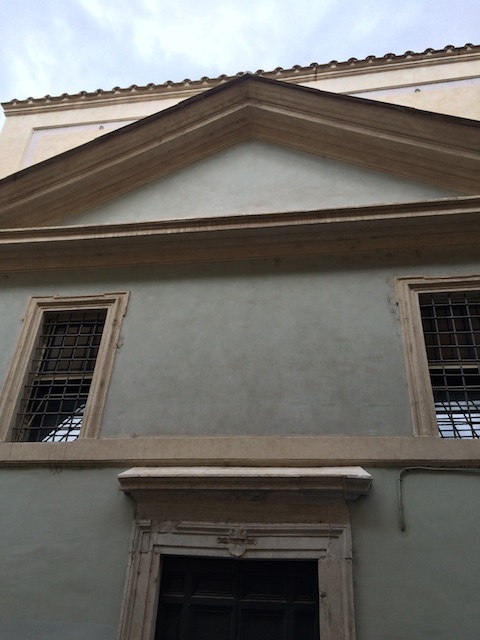 San Pietro in Vincoli – go to see Michelangelo’s great tomb for Julius II. Suffer silently the photographing gaggle of fools. Santa Maria degli Angeli & the Diocletian Baths – if I recall correctly, the primary interest here is the size and rawness of the space. There is possibly a group ticket that covers 2-3 other museums (which fall within the National Roman Museum of archaeology), including the Palazzo Altemps. 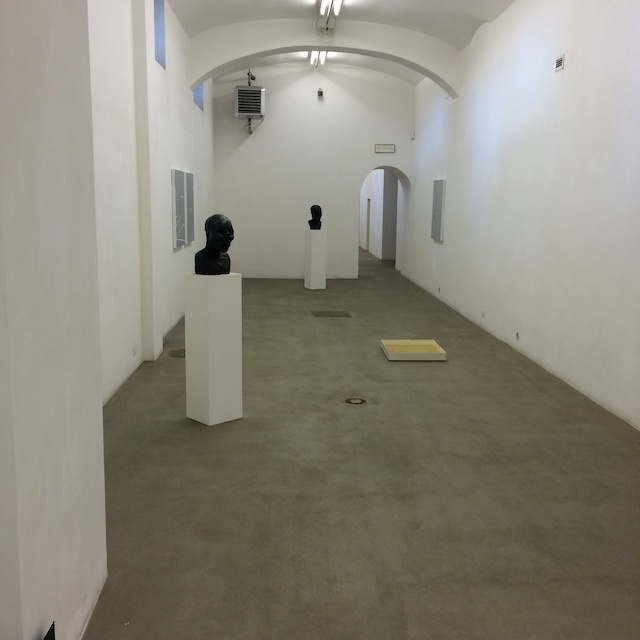 Palazzo Altemps – must go, wonderful art in a wonderful, not super crowded, space. Palazzo Massimo and the Balbi Crypt are part of this ticket also. Arca Sacra del Largo Argentina – a field of ruins, still under archaeological intervention, that is home to a large family of cats and bums. Very atmospheric. Ara Pacis Augustae – the ex-mausoleum, in the form of an Etruscan (?) tumulus, of Augustus, very grand, very ruined. Not sure one can go inside, but there is also a modern museum next door with an exhibit about a relief that recounts the achievements of the Emperor. The pizzeria, restaurant, enoteca in the Piazza di Augusto Imperatore (Gusto), is meant to be very good, and is hyper-trendy. Chiostro del Bramante – a wonderfully un-crowded space, with a fine little cafe, and excellent shows – we saw the great Catalan Joan Miro, as well as Karl Lagerfeld there. Santi Quattro Coronati – it is venerable, from end of 6th century. Not really sure what else distinguished it other than it’s great antiquity. An opening at MACRO I just walked into. Very cool. GNAM – near the Villa Borghese, this is perhaps somewhat overlooked in a city of brilliant old art, but has a strong collection of 20th century Italian art; we saw some great Fontanas, Burris, etc. Fahrenheit 451 – my favourite bookstore, in Campo dei Fiori. Definite art and left-wing stance, with lots of postcards that I think might date to the Red Brigades years. There are a few other art bookstores nearby. Vatican – besides the usual stuff at the Vatican museums, bankers might care to seek out IOR – the Institute for the Works of Relgion, aka the Vatican Bank. 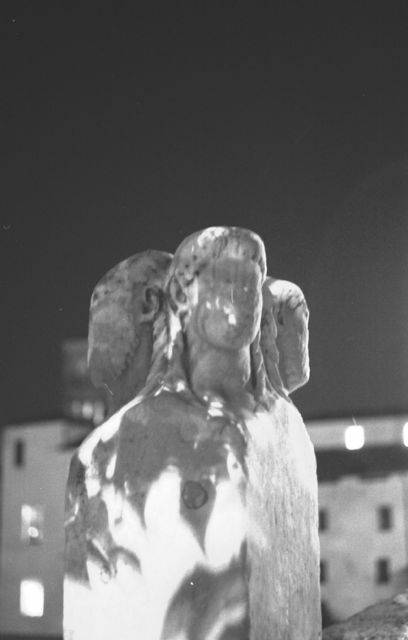 A perpetual centre of scandal, most famously in relation to the Roberto Calvi affair (the head of the bankrupt Banco Ambrosiano, found hung at Blackfriars Bridge, supposedly for losing Vatican, and Mafia, money). Shameless plug for your correspondent. 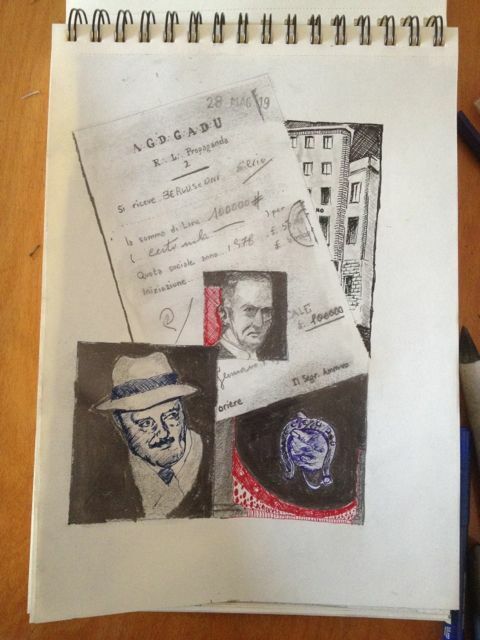 I did this when researching the Calvi affair; note P2 certificate of one Silvio Berlusconi. 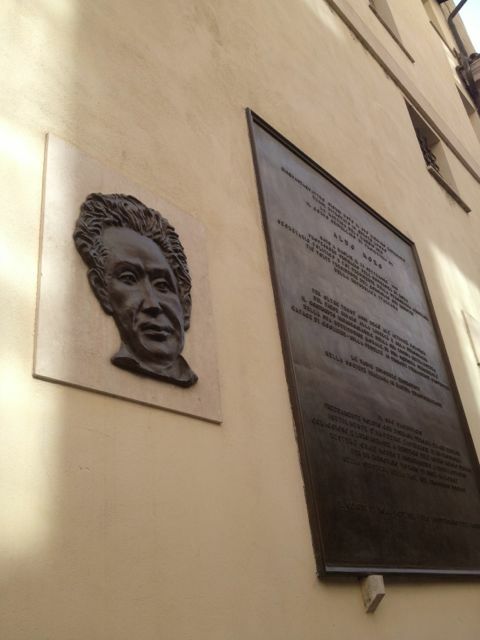 Via Michelangelo Caetani – a plaque marks the spot where the kidnapped PM Aldo Moro’s body was found in the boot of a red FIAT, precisely half-way between the Communist Party and Christian Democrat headquarters. Have a drink to Moro at a Communist wine bar, possibly at 35 V del Monte della Farina. This is a bit long – but is basically stuff I loved about Rome during my 5 week stay there in the summer of ’12. As ever, my taste is idiosyncratic ! I liked the Hotel Eden from years of staying there, almost on top of the Pincian Hill, sort of above the Spanish Steps. It is very dear, and even if you aren’t staying there, it’s worth splurging on a drink or cigar, in the rooftop bar; on summer evenings, I’ve seen starlings massing over the Tiber. For apartments, Rione (District) Monti is unbeatable: just up the hill from Via dei Fori Imperiali, putting it equidistant from the Colosseum and the Quirinale (Presidential) Palace. So very close to the main touristic spots, but relatively few tourists loiter there, as there’s nothing in particular to see. 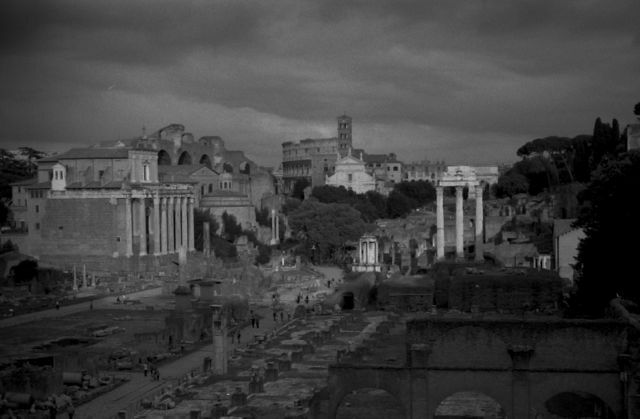 It also means that one can wander around the Forum and the Campidoglio at all hours, which is a lot more rewarding than going there during the day. Restaurants/bars I tried & liked: for brevity I omit tens of others I never bothered with, once I found below and started cooking. 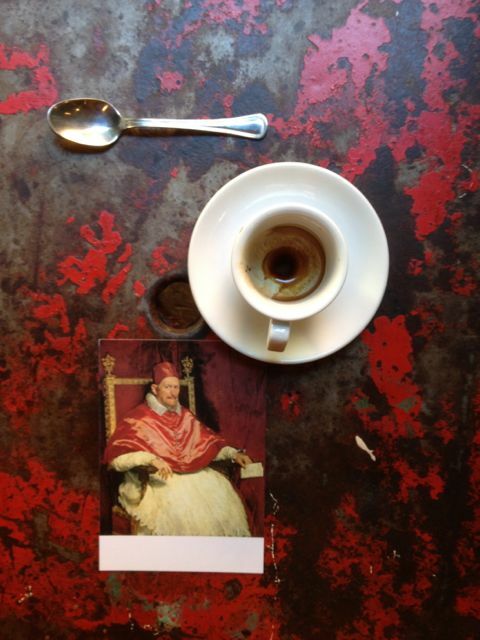 See NY Times for excellent, and fairly up-to-date, tips on Rome. 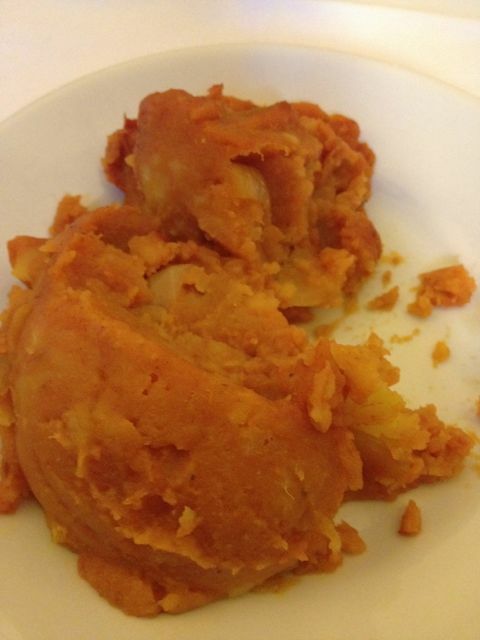 Pommidoro – in San Lorenzo, it is my favourite. An old working class restaurant, yet with splendid game, some of it from the family’s hunting estate, it was a haunt of Pier Paolo Pasolini, and is filled with some of his artwork as well as old gallery posters. Very few tourists, and a somewhat artsy crowd due to the studio complex next door. Great steak, offal, mushrooms in season. They make & bottle their own oil for sale. Trattoria Da Teo – in Trastevere, but slightly removed from the busy bit. Very crowded, mostly regulars, but they try to accommodate. The potatoes mashed with tomato, bacon/lard, onion and garlic is gorgeous. Enzo – in Trastevere. 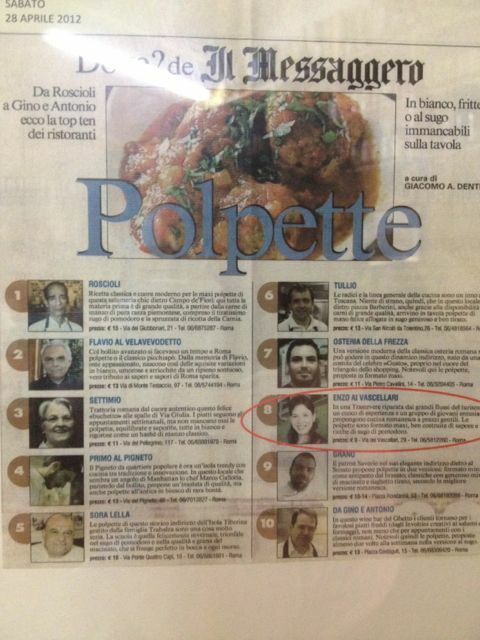 Honestly, I don’t really remember the food, this is a humble trattoria, but I suspect we really liked it, as I retained a clipping from Il Messaggero on the best meatballs in town, and this place showed up. 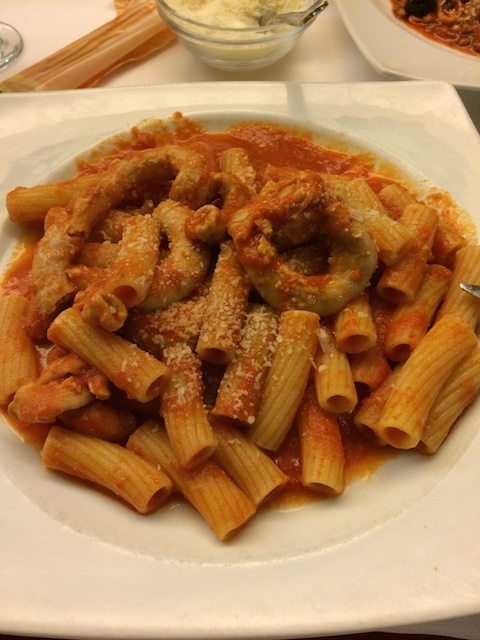 Ristorante ai Marmi – in Trastevere, an old pizza joint. Named for the marble topped tables, recalling a morgue, very fast food: pizza and fried things, and precious little else. Piperno – haven’t been here in a few years as it’s expensive, but the food is excellent, and a great place to try Jewish specialties (it is in Ghetto). Best anchovy stuffed zucchini flowers I’ve had. La Matricinella – via del Leone. Quite touristy, but also lots of regulars/Italians. 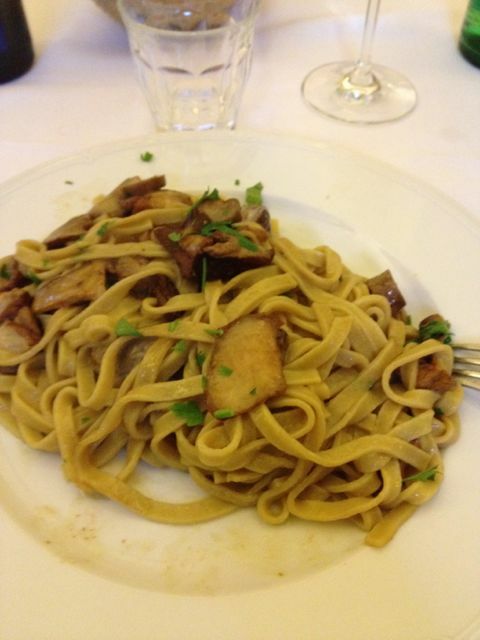 Food is standard Roman fare, very good, moderate prices. 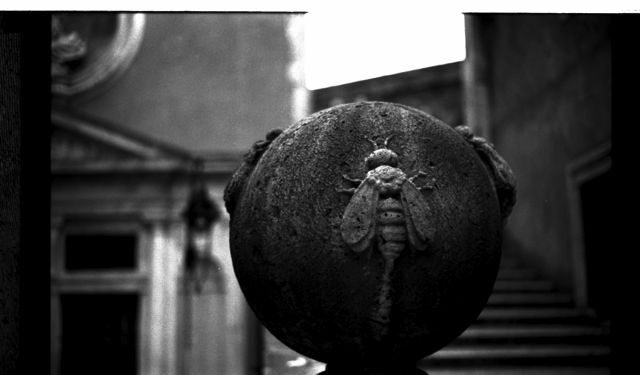 Al Moro – near Spagna. Excellent food, very expensive, and sometimes requires a bit of spine, as they will try to stuff tourists into a back room. The preferred outcome is to sit in the second room (the front room is mostly regulars and a group of old men playing cards). The waiters are nice enough, the maitre d’ isn’t particularly pleasant (more accurately, he is strafottente…somewhere between arrogant and obnoxious). The food is great. Americans: you will really fit in a lot better if you don’t wear shorts, but do as you please (technically they don’t allow shorts, but a seemingly wealthy family of four were allowed in). In Monti, on a street parallel to Via Baccina, very near to the Via dei Neofiti intersection (if not actually that), there is a fine little trattoria. Very good food. Ai Tre Scalini – on Via Panisperna in Monti. Lovely wine bar, friendly staff and customers, they suffer hapless tourists with civility. The food is really good, albeit pre-cooked and warmed up (as you’d expect in a wine bar). Also on Via Panisperna, further up the hill (going away from Pza Venezia), is a cafe, white I think, very simple, on the left side of the street. There is a very tall Argentine and a short bald man who run it, it’s nothing special, but great for coffee. Not open after 8pm. Mother India – Via dei Serpenti, very good Indian food, and excellent service. Expensive (for NYC/Ldn conditioned curry-eaters), but pretty few choices if you get an itch… It is a stop on 3-4 coach tours from India, per day, so can get fearsomely crowded, best to call or stop in to check conditions. Sunday night I think was good – one of the few places where a channa masala actually has a burnt-tandoori flavour. Al Vino al Vino – just across from Mother India, there is a little wine bar that’s perhaps less young and laid back than Tre Scalini, but is still pretty good, and quite possibly, less touristy. On Via Leonina there is a splendid paninoteca , I think the outside is a little garish and there are black-and-white pictures plastered inside; she makes super sandwiches, particularly with vegetables (marinated, as well as sauteed), anchovies (in oil or marinated), etc. I et there most days. Ristorante Relazioni Culinarie – check before you go, but I think this was a Sicilian-inflected place, which is actually really nice once you’re sick of lard, pecorino romano, tripes, etc. Bar Fico – for aperitivo a very chic bar/cafe with a found-object aesthetic inside, nice staff. There is a restaurant of similar name (probably the same business) around the corner, I prefer the bar, which is under a fig tree, and in the evenings has a gaggle of old men playing chess. Pizza – at, or very close to, 284 Corso Vittorio Emmanuele is a takeaway pizza place. I shouldn’t rush across town for it, but I thought there pizza was great, and (it might be a chain) they took great pains to explain about their dough etc and it’s great digestibility/lightness ! Across from Santa Cecilia in Trastevere, on Via di San Michele, there is a little white bar/cafe with good drinks, very good food, that is mostly local office-workers. Is great for a cocktail while watching life in the, relatively tranquil, Piazza. The staff are nice and negronis good. 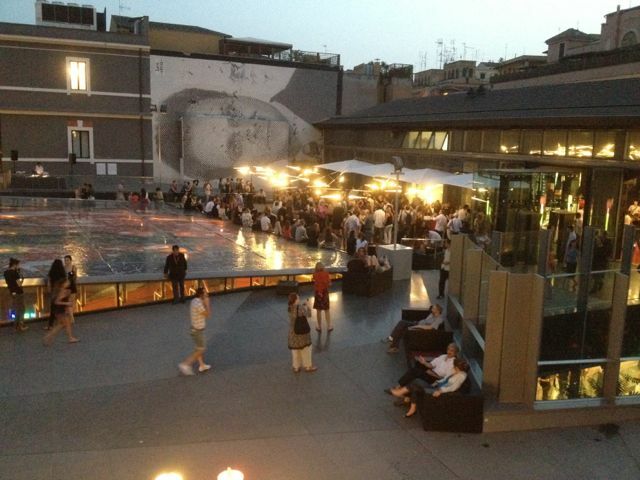 Bar Camponeschi – Piazza Farnese, very pleasant to spend a summer evening here watching the square. The staff are wonderful, the clientele rather posh (after all the restaurant/bar is in the ground floor some elderly Principessa’s palazzo). Roscioli – there are two, one is a pizzeria/takeaway, one is a very fancy businessman/diplomat place serving simple food. I prefer the informal one, and there pizza marinara is outstanding. 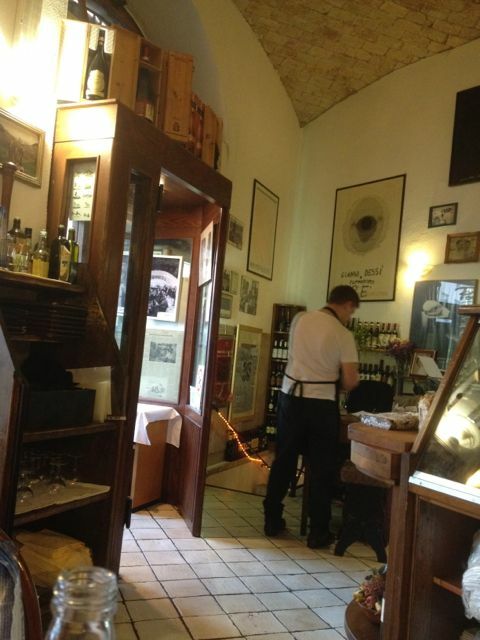 A little enoteca on Via dei San Martino ai Monti, have a glass under the monastery and the big tower. Almost magically quiet, only 5 minutes from Cavour.